Oil painting on wood panel. 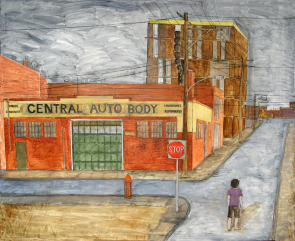 Artist's caption: "At American and Fairmount Streets, the Central Auto Body shop is now a sculpture fabrication shop. Behind Central is the L’Eau Condominium under construction." Images shows Central Auto Body building.